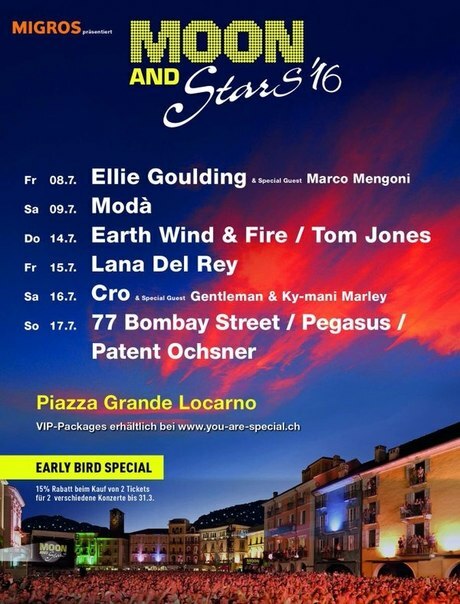 Lana Del Rey will perform at the ‘Moon and Stars’ music festival in Locarno, Switzerland on July 15th ast 20:30pm. The festival lasts for 9 days and other performers include Ellie Goulding, Tom Jones and Earth, Wind & Fire. Tickets are available here. Lana will also be performing at the Orange Warsaw Festival on June 3rd at the Horse Racing Warsaw in Służewiec, Poland. In addition to Lana, the festival has announced Skrillex, Die Antwoord, Editors, Skunk Anansie, Tom Odell, MØ, Daughter, XXANAXX and Julia Marcell. Tickets are available to purchase here. Where else is Lana Del Rey performing in 2016?